Carey Mayor Rick Baird, left, and Hailey City Councilwoman Carol Brown listen to Ketchum Mayor Randy Hall discuss the ongoing dispute over who should pay for emergency dispatcher salaries at Blaine County’s consolidated dispatch center. A solution to the ongoing dispute over who should pay for the salaries of emergency dispatchers in Blaine County appears to be as elusive as ever. Still, elected officials from Blaine County and local cities attending a Wednesday night meeting agreed on at least one matter: After several hours, they decided to hold another meeting. They'll get together again in early December to break the stalemate that has now stretched on for almost half a year. The all-day meeting, which will be run by a mediator paid for by the city of Sun Valley, will begin at 9 a.m. on Friday, Dec. 5. The brouhaha began this summer when city leaders in Hailey and Bellevue declined to contribute the amount requested by the county to help pay the salaries of 12 to 13 dispatchers at the county's new consolidated dispatch center. The annual price tag for funding the dispatcher salaries is estimated at $835,000. The meeting at times appeared to be headed toward a nasty train wreck as leaders from the north valley clashed with those from the south. The seating arrangement—with south valley and north valley leaders face-to-face on opposite sides of the meeting room—provided a graphic illustration of the gulf between them. 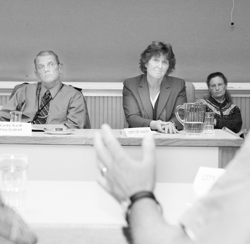 At times, it seemed doubtful that Sun Valley and Hailey officials could bridge the gap. At several points, it was left to Ketchum Mayor Randy Hall and Carey Mayor Rick Baird, who was representing the Carey Rural Fire District, to keep the meeting moving along. "There's got to be a way where we walk out of the room and say we're all winners," Baird said. Blaine County Commissioner Angenie McCleary, who had organized the get-together, also lent a tone of calm to the gathering. It took Bob Werth, a professional mediator from the Wood River Valley, to keep the conversation moving in a positive way. He commended the participants on what they were able to accomplish during the several-hour meeting. "I feel like we heard things tonight that might be a solution," Werth said at the end of the meeting. Though participants batted about ideas for how to provide different levels of service to different cities, as well as possible sources of new revenue that could partially solve the funding crisis, they failed to discuss in great detail the biggest question of all: Do Hailey and Bellevue leaders actually believe they're obligated to provide funds for dispatcher salaries over the long term? So far, the cities have only agreed to pay about a quarter of the amount requested of them, and just for the 2009 fiscal year. Of course, Bellevue and Hailey may not have enough money in their budgets to help cover the dispatch costs. "Honestly, it's just not there," Bellevue Councilman Steve Fairbrother said. For these reasons and more, the consequences of the cities' continued refusal to agree to a long-term funding plan remained unanswered. For now, the county has settled on a plan that charges the cities and other dispatch users on a per-call basis. Repeatedly throughout the night, Baird asked whether there may be a different way to spread the costs, such as tacking on an extra "dispatch fee" to traffic tickets. Still looming is a Dec. 11 mediation session before the Idaho Emergency Communications Commission requested by the city of Sun Valley. Ketchum Mayor Randy Hall repeatedly pressed Sun Valley Mayor Wayne Willich to agree to delay that date to allow the current talks to continue. "I'm just trying to find some middle ground here," Hall said. But his requests went unheeded as Willich said he would only cancel the mediation if a solution were found. "I'm still working on Dec. 11," he said.